Right next to the Studio Catering Company, this walk-up bar serves specialty cocktails along with draft and bottled beer, wine and sangria. 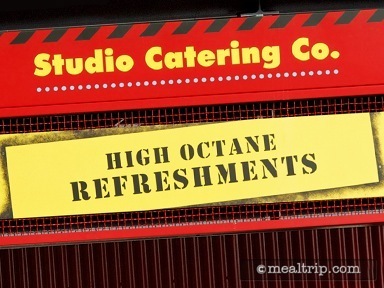 High Octane Refreshments picks up the same “warehouse-backlot” feel as it’s neighbor counter-service location, and offers outdoor, covered seating only. Ever since I started seeing the specialty drinks that were available over the holidays at the High Octane refreshment kiosk, I've wanted to try one. Now... it's been said that if it wasn't for bad timing, I wouldn't have any timing at all, and that's certainly been the case with my quest to get a beverage from this warehouse themed, backlot, walk-up counter which is located right next to the Studio Catering Company dining area. Each time I went out to see the Osborne Family Lights display, I thought "it sure would be nice to have a beverage right now". 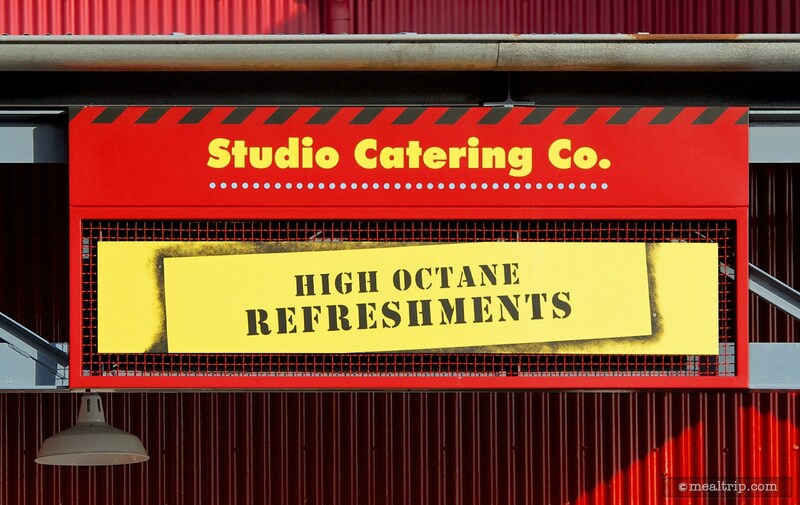 But for the past three years… on every single attempt, the High Octane refreshment kiosk has been closed. So sad. However, my timing and luck was about to change, for one Saturday afternoon in the middle of July, I found a real bartender, actually making drinks! And while I could not get the Holiday themed "Snowball" that I've been longing for (because, well… it's the middle of July after all), I did get to try one of High Octane's signature drinks, the Banana Cabana, which features Cruzan Mango Rum, Coruba Coconut Rum, Creme de Banana, with Orange and Pineapple Juice and a splash of Grenadine. I've always said, if you're going to get an adult beverage in a theme park, find a bartender… and the bartender at High Octane, did not disappoint. These cast members have to know how to make the dozen or more beverage that are available at the kiosk, all day long, and very quickly. Because there's more to it than just pulling a lever, they are more likely to get the combinations right. I watched as drinks were being made for the five or six guest in front of me, and the bartender was just nailing them, three bottles at once, spouts low to the glass rim, and right there in front of you. Much better than my recent experience at Animal Kingdom's Drinkwallah, where most of the rum was left out of my rum lemonade. The High Octane line itself can be a bit slow if there's only one bartender (because they are making drinks to order, it's a bit time consuming). I did notice after the first hour or so of the stand being open (so, by 1:00pm on a Saturday), there were two bartenders… which I'm sure will move things along more quickly. There's certainly room for two back there, unlike some of the other, small, kiosk type of locations throughout the parks. Price-wise, because there are multiple open bottles involved (and not just the one-shot, or the pre-mixed deals you'll find a smaller carts), drinks here tend to be in the $8-$9 region, but that's not out of line with other locations in the parks. The drink itself, was spot-on delicious. I was a bit worried that the Creme de Banana would be overpowering, but it just added a bit of cloudiness and a nice tropical hit to the drink, (but honestly, was just barely noticeable). 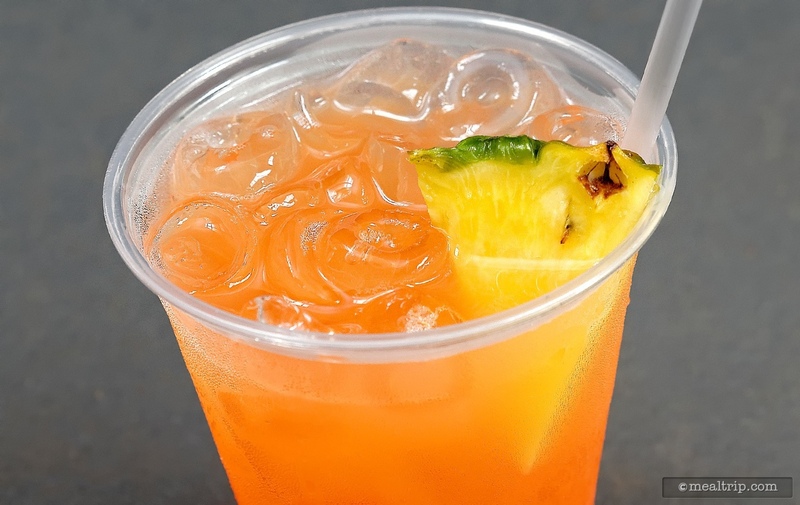 Mostly, the combination of Cruzan Mango Rum with the orange and pineapple juices were at the forefront. A great drink, for the middle of July! 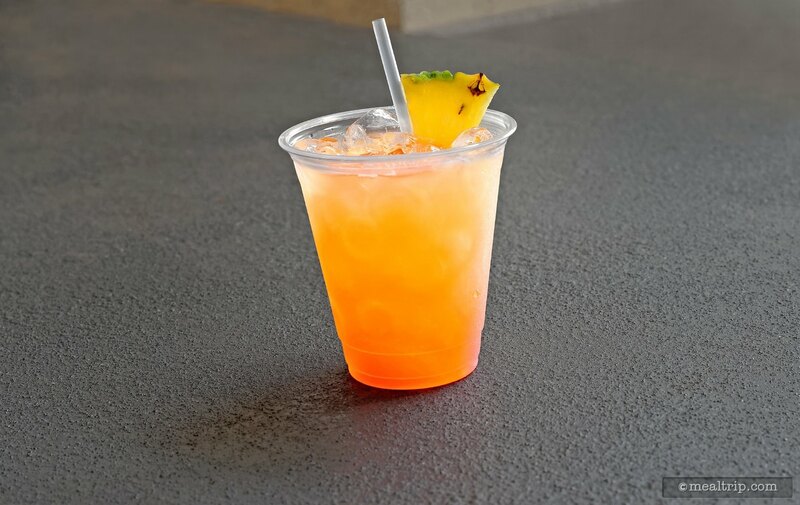 I hope that I can find the High Octane counter open again on my next visit, because there's a couple more drinks on the menu board, (like the frozen Rum Runner and the Blue Skyy Lemonade, not to mention my Snowball in December) that I'd really like to try.